With time and convenience being such a big factor in people’s eating decisions and habits, having easy options is always a plus. Throwing some turkey, chicken, or leftover meat in a wrap for the next day’s lunch is always a great meal idea and lunchtime staple. With an extra 300 calories and 50 carbs, generic tortillas and wraps can turn today’s lunch into a carb-loaded hazard. Below is the breakdown of some popular tortillas that are common among lunchtime meals. 1. Place the first five ingredients into a small bowl and whisk together. Pour mixture over the chicken and stir together. Set aside and allow chicken to marinate for 10 minutes. 2. Place all ingredients for cooking sauce into a small bowl and whisk together. Set aside. 3. Place 2 tablespoons oil into a large skillet over high heat. Sauté chicken for 6 to 8 minutes or until half-cooked. Remove from skillet and set aside. 4. Pour remaining oil into the same skillet and place over high heat. Sauté the ginger, garlic and shiitake mushrooms for about 5 minutes. Add the bamboo shoots and water chestnuts and sauté for an additional 3 minutes. Season with salt and pepper. 5. Add chicken back into the skillet; cook and stir for 2 minutes. Pour the cooking sauce over the mixture and stir together. Lower the heat to medium and allow the mixture to thicken, 2 to 4 minutes. Stir in the green onions. Adjust seasonings. 6. Remove from heat and allow chicken mixture to cool slightly, about 5 minutes. Top with a sprinkle of green onions and sesame seed and serve warm with crisp lettuce cups. 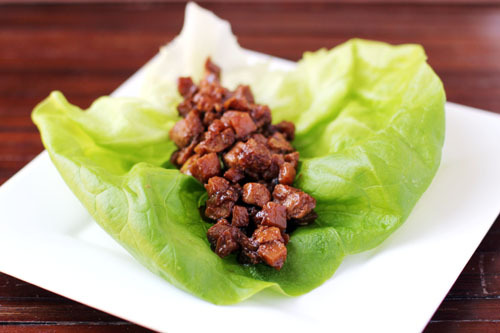 A lettuce wrap is a great alternative for a tortilla when making a meal. Some athletes, or those looking to gain weight and a more calorie dense meal, might make the argument that the tortilla gives them extra protein and calories to meet there needs. Instead of filling up on processed and empty carbs received from a tortilla, adding more meat, beans, or vegetables to make up for the calories you will be loosing from the tortilla is ideal. Any time you can substitute a processed bun or wrap for something that is natural and has nutritional benefits is always encouraged. My suggestion is to not only substitute the lettuce for tortilla wraps, tacos, and burritos, but also for buns and bread. This will force you to add more of the “in between ingredients” which will provide more of a nutritional benefit to everyone. Studies have shown that regularly skipping breakfast increases your risk of obesity by 450%! This week’s blog can be found at http://www.builtlean.com/. This is another great health-orientated website and one that I will be writing for once a month. My article is the headline article on the homepage. Thanks for reading and let me know if you have questions or comments.